I've read a few blogs and articles recently stating that cloud computing is hurting VC. I tend to disagree - cloud computing has certainly made it cheaper to start a new venture, thus requiring fewer VC dollars. But it's relative. Eight years ago, my startup received a couple million of VC -- a lot of that was burned on infrastructure such as servers and licenses. Today, we could have rented this from Amazon for a few hundred bucks a month. We would have required less VC money, and would have been able to keep more of the company, but a good idea will attract VC. 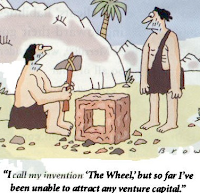 Today's VC problems can be attributed directly to two things: the stock market and a general lack of innovation.